Press Pass is younger than most of the surviving sports card manufacturers, but it's managed to carve out a nice niche for itself by trying new things and steering clear of battling other companies for licenses in the biggest pro sports. The Charlotte-based company's biggest claim to fame is using pieces of race-used tires and sheet metal in its NASCAR sets in 1996, several years before that practice became commonplace within other sports card products. 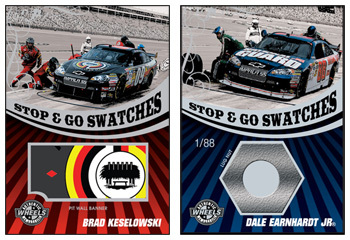 Speaking of NASCAR, Press Pass began printing cards for America's most popular racing series in 1993 and outlasted several other companies to emerge with that segment of the market all to itself. Though it has no competition, Press Pass continues to alter its product mix and experiment with new concepts in order to avoid becoming stale. Draft pick cards for athletes entering the NFL and NBA have also been some of the company's more popular sets over the years, with most of them featuring plenty of on-card autographs from incoming rookies. However, a 2009 exclusive agreement between Upper Deck and the Collegiate Licensing Company has called the future of those products into question. To expand its sports card offerings, Press Pass has dipped into the past to come up with new brands. Its Legends sets heavily feature retired stars, and Fusion brings together players from several different sports. Press Pass has created non-sports cards for some high profile entertainers, including Elvis Presley and Kiss. It also periodically releases licensed die-cast vehicles for various sports.